The magic of the Wonderbag is in bringing communities together. Please see below for upcoming and past Wonderbag activation and awareness events. An opportunity for YOU to get involved with Wonderbag. Next January, you will be able to see the magic of the Wonderbag and the WonderFeast first hand through traveling to the Wonderbag manufacturing facility, activating Wonderbags in a local community, and exploring the African wildlife during game drives. This Activation Visit is provided through a strategic alliance between Wonderbag and Africa’s Gift, a dynamic UK registered charity that has been at the forefront of powerful community development. The primary challenge on this trip was the ascent of the world’s tallest volcano and Africa’s highest mountain, Mt Kilimanjaro (5895m). In advance of the departure, participants fundraised to buy and introduce Wonderbags throughout the visit but especially on Kili where they cooked all the way to summit and ate hot breakfast from Wonderbags at sunrise! I live in California and I teamed up with Wonderbag, my classmates at Mark Day School, and our partners eSibonisweni Primary school in KwaZulu-Natal South Africa to host a Wonderfeast! Together, we will feed 1,200 students and parents in one celebratory day in July 2018. Each and every family went home with their very own Wonderbag and the training on how to use it. Here’s my story of how I turned my love of baking into a global action. Themed, ’50 Shades of Pink’ the event took place on 2 June at the Durban Country Club. Models showcased the latest designs by some of Durban’s top designers, Sune’ B, Carol Clark, Brenda Quin and Swanky Modes. Sarah Collins, entrepreneur and designer of the world acclaimed Wonderbag was the guest speaker. During her talk, she shared experiences in her journey of uplifting women in Africa and developing countries. Wonderbag Founder and CEO, Sarah Collins, traveled with the Wonderbag team to Thembelihle Primary School in KwaZulu-Natal, South Africa to activate Wonderbags within the community and serve hot Briyani for just in time for lunch. Thembelihle Primary School is an independent school that provides quality education to young children from disadvantaged backgrounds in the village of Howick in the Province of KwaZulu-Natal in South Africa. A letter from Wonderbag CEO and Founder, Sarah Collins: It is with Wonder and humility that I have spent the past few days with my colleague Sarah Jane Gullick activating Wonderbags in a Burundi Refugee Camp. The Red Cross invited us to participate in solving a humanitarian crisis which is growing daily: the crisis of cooking fuel which has run out in the camps and host communities. It is indeed a massive crisis in the whole of Rwanda but on this trip we are focusing on Refugee camps. Rwanda has a population of 11 million people with 400 homes per sq km. Wonderbag student ambassador Chiara led students in a hands-on eco-friendly cooking demonstration during “Community Heroes: Day of Giving” where kids take part in service activities that give back to their community. These projects are all led by young people who feel empowered to create positive change in the world. Participants helped prep a meal and deliver it to people experiencing homelessness. Students learned, prepped food, and were inspired about how we can all make great impact in the world. Sarah Collins, founder and CEO of Wonderbag, hosted some of the most incredible women she had met over the past years. The purpose of this coming together of like-minded women was simply to share thoughts and inspirations, and to discover what women with voices can do, to effect and inspire so many communities of women, to discover and celebrate their abundant resources of talents. In honor of Nelson Mandela day, the Wonderbag Foundation helped spread the love of Ubuntu in memory of Madiba. 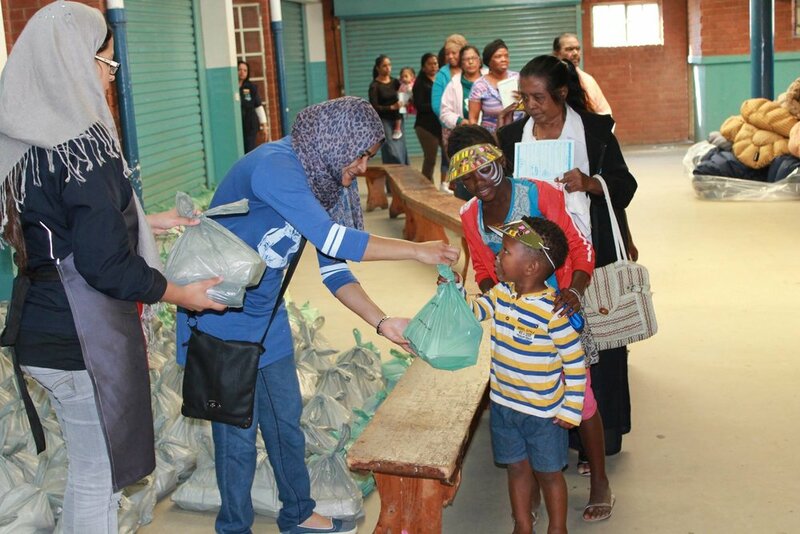 We rolled out a community feeding initiative to feed 600 resident families in the Tongaat area at Belvedere Community Centre. We partnered with KZN Wildlife to host an activation event and prevent rhino poachings in the Kwa-Zulu-Natalin region of South Africa. We distributed Wonderbags with a custom embroidery that included education on rhino conservation and a call to action if rhino poachers were spotted. We travelled to a Syrian refugee camp in Jordan to distribute Wonderbags. We experimented to see how many meals could be cooked using the Wonderbag in the same time and with the same amount of fuel as a traditionally cooked meal. We found that the Wonderbag allows three meals to be cooked under the same methods.